In the Democratic Republic of Congo, MCSP is working in collaboration with the Ministry of Public Health (MOPH) to strengthen the national integrated management of childhood illness (IMCI) and integrated community case management (iCCM) strategies, and supporting their rollout in Tshopo and Bas-Uélé provinces. Part of the IMCI strategy includes assessing the nutritional status of sick children and counseling mothers on how to feed their children. The iCCM guidelines primarily focus on the identification, treatment, and referral of children who have diarrhea, pneumonia, and/or malaria. The nutrition component of iCCM is limited to screening for malnutrition, which includes identification, referral, and subsequent treatment of severe acute malnutrition (SAM). It provides brief guidance on continued feeding of sick children. The preventive aspects of nutrition within iCCM guidelines—including strengthening infant and young child feeding (IYCF) practices around breastfeeding, complementary feeding, and counseling skills of health providers at the community and facility level on IYCF—are weak, as the main focus of the approach is on treatment. 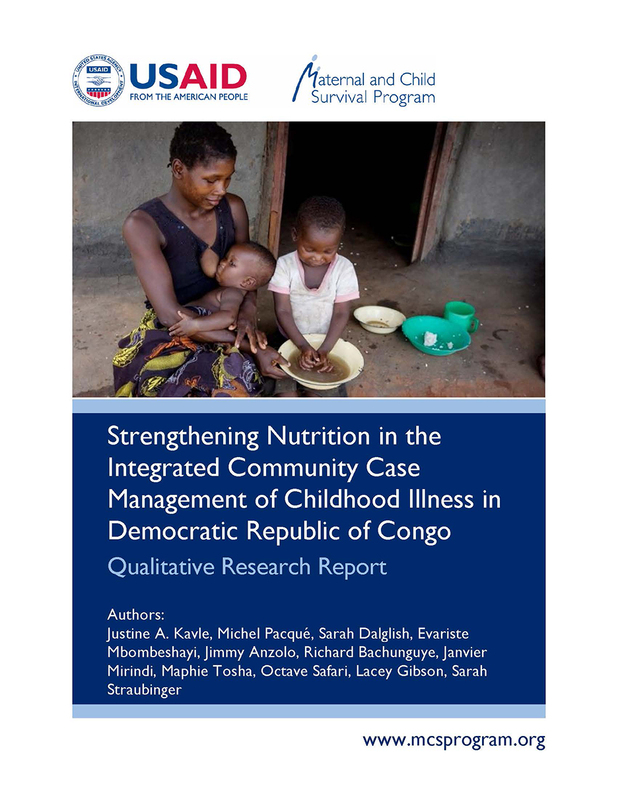 MCSP, the MOPH, the Programme National de Nutrition (DRC national nutrition program, or PRONANUT), and others have identified the need for strengthening the iCCM strategy’s nutrition content, making sure it is consistent with and based on local knowledge, beliefs, and feeding practices. This should go hand in hand with an approach that assures that community- and facility-based health providers deliver the content as intended in a supportive way. Examine cultural beliefs and perceptions of IYCF, child illness, and care-seeking behavior for sick children. Examine the perspectives of health providers who provide counseling on nutrition and iCCM. Understand roles of key influential family/community members. Identify gaps and opportunities to strengthen nutrition counseling for caretakers of children under 5 at the health facility and community level.